Can Legalmaster create Electronic Bills? Legalmaster can create electronic billing data in scores of formats. Generally speaking, as new formats are requested by the industry, we make them available within two weeks. Below is a list of the more frequently requested formats. All of these and many others are now available. 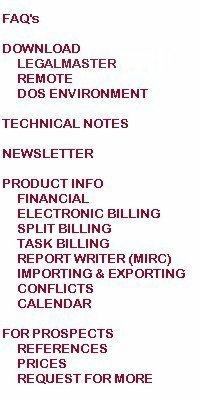 In addition to these "canned" electronic formats, a few companies are asking for billing information in the form of a spreadsheet file (Lotus or Excel). Legalmaster can do that, as well. Your and our biggest challenge is that the companies who demand that you submit bills electronically often have disparate and conflicting requirements. The structures of their electronic files vary and the task coding systems that they use vary. Most of them are having their bills mediated by third parties such as Litigation Advisor, Examen, Law Audit Services, Petersen, Tymetrix, ELF, Datacert, eVelocity etc. While most of these companies ask for task coding, they do not all use the same list of task codes. Nevertheless, most call whatever list that they do use either The ABA List or the UTBMS (Uniform Task-Based Management System). Many of these companies attempt to sell you software (and even hardware) that they claim is necessary to create data in their required format. It has been our experience that you need not buy anything from them unless you choose to do so; Legalmaster can produce data in any format that any company has ever requested. Remember, if you enter your fee and cost charges in another piece of software just for this one client, you would probably want to enter the charges redundantly in Legalmaster in order to keep complete records of all of your matters in one place. Not only is such redundancy inefficient, but it is unnecessary, since Legalmaster can create the data just the way they want them. If you need any of these formats, or others, for that matter, just give us a call. All of Legalmaster's Windows versions support electronic billing.